Welcome to our country kitchen designs gallery. 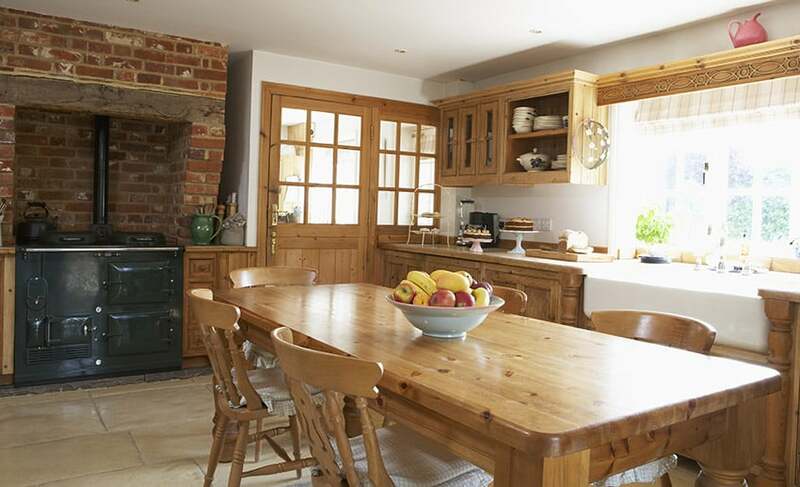 Country kitchens often have open layouts with traditional cabinetry and decor. One might think of a rural farmhouse design with a rustic and warm feel. 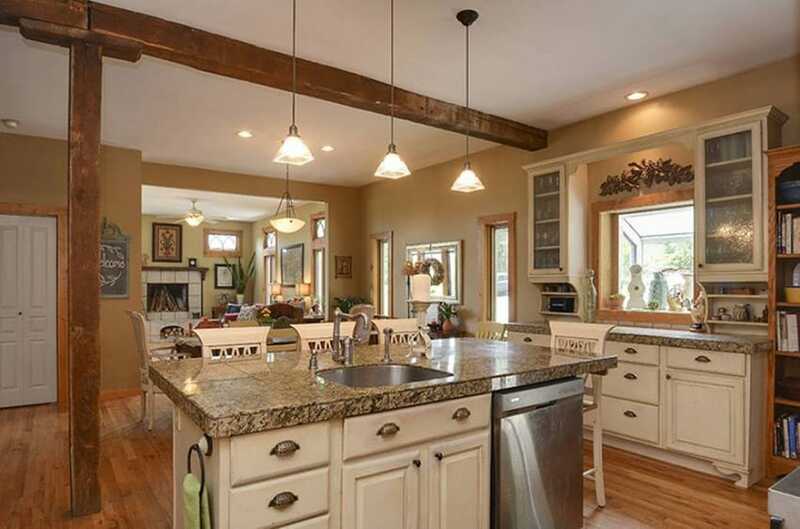 However many realtors and homeowners consider the country style to be a large kitchen with an open layout. 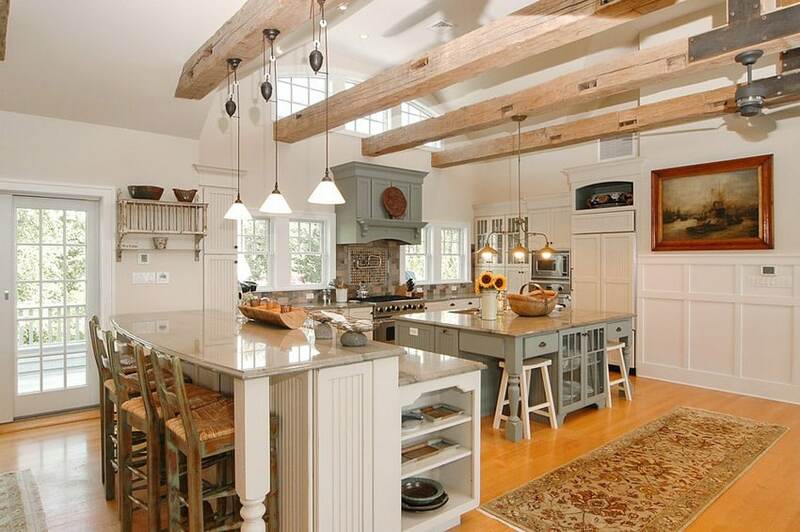 Country kitchens often have breakfast nooks or dining islands with plenty of space to eat-in, hang out and socialize. The country kitchen design above has a more rustic and romantic feel to it, as it uses pale, muted colors to achieve this look. Walls were painted in off-white, while floors uses engineered maple wood, giving the space a nice light background which is further brightened up by the large windows and doors in the space. The classic country kitchen cabinets painted in white and topped with a light gray granite, while the kitchen island and the range hood cover paints its base in light sage green, giving at the refreshing pale tone which matches the antique sage green finish used on the rush seat bar stools. Ornamental wooden beams in natural weathered finish were also used to complement the over-all look, and also serve as the mounting for the drop lights and chandeliers. 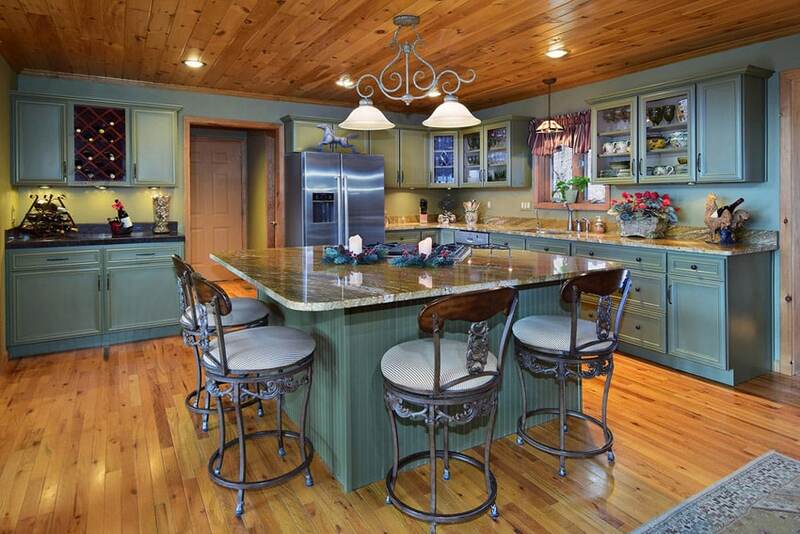 The combination of colors and finishes in this kitchen definitely gives that country vibe. Solid teak floors and ceiling combined with Persian green walls gives both a warm and rustic feel to the space. 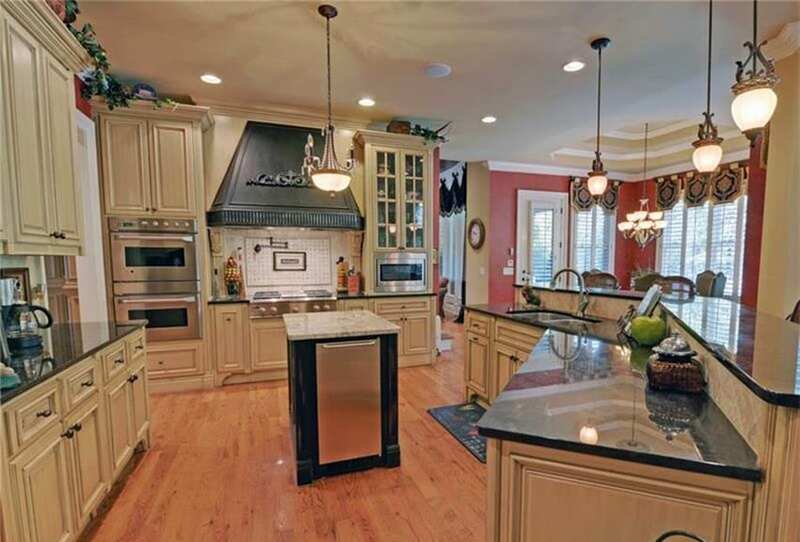 The kitchen cabinets are traditional style cabinets with molding details and vertical wood panels. They were also painted the same shade of green as the walls, creating a very rustic old world look. 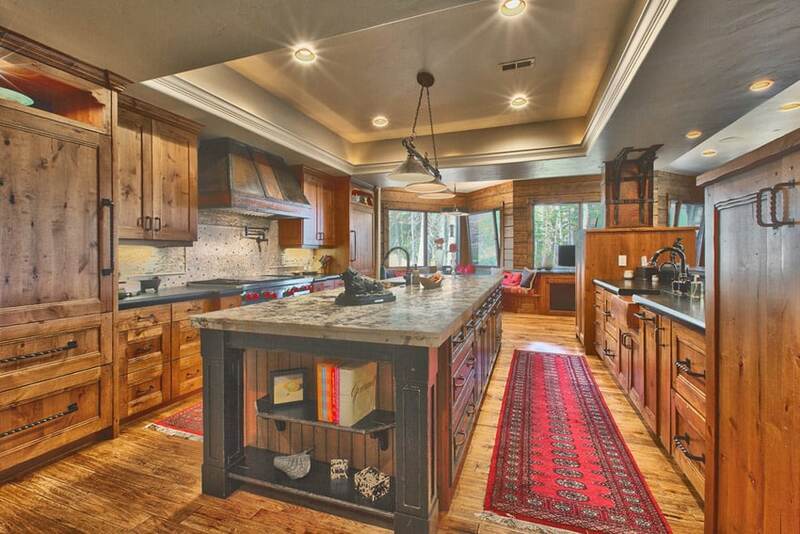 This country-inspired kitchen mixes modern design aesthetics with rustic elements. The natural stone floors in various sizes give that rustic feel to the space as well as an outdoor-like feel, and this dark-colored floors is balanced out with the use of light cream kitchen cabinets with simple black granite counter tops. Walls were kept white as well as the ceiling with exposed wooden beams, while the large casement windows help illuminate the large kitchen and make it look bright and refreshing. 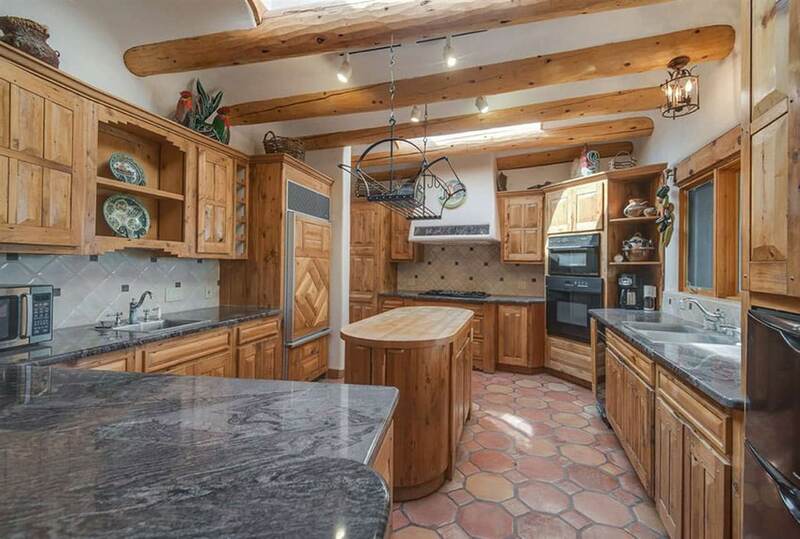 The lighting and finishes used in this kitchen really gives off that old country vibe. There’s a nice mixture of smooth and natural textures, creating a dark rustic feel typical of traditional country kitchens. The kitchen cabinets is a combination of dark walnut and antiqued finish sage-green kitchen island with a classic wrought iron overhead pot rack. 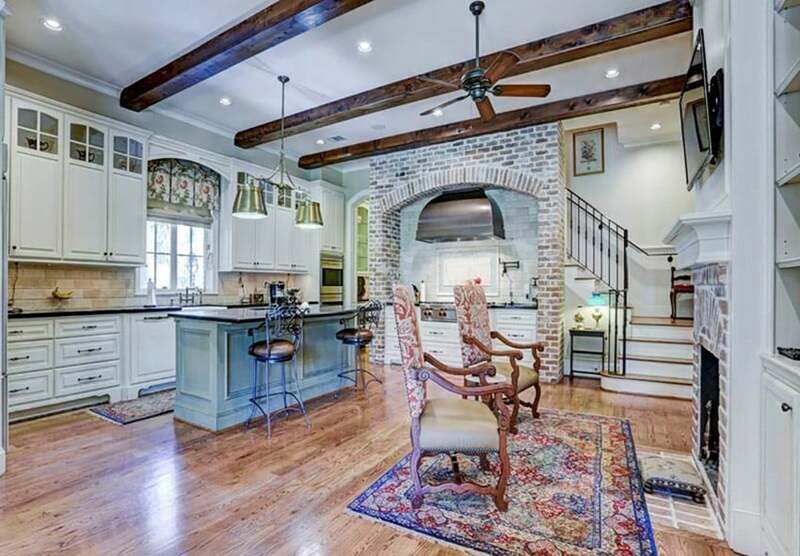 The ceiling has exposed bricks and wengue finish wooden trusses adding to the rustic feel of the kitchen. The exposed solid wood ceiling framing in this kitchen design not only adds an interesting element to the space, but also helps vertically expand the space. 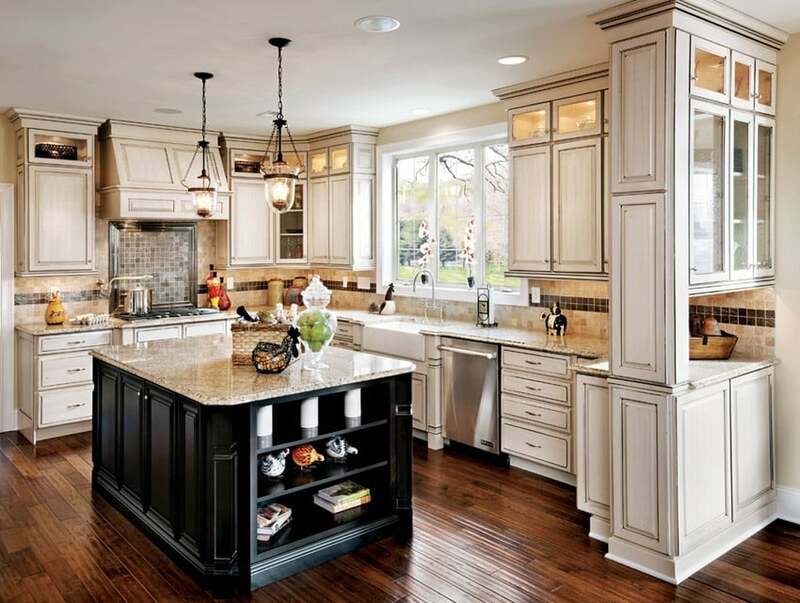 The traditional style kitchen cabinets is a mixture of golden walnut and white painted wooden cabinets, creating a good balance or light & natural colors. Interestingly, the kitcheb island uses wengue base cabinets instead, making it stand out from the rest, yet being subtle enough to blend seamlessly along with the other elements of the kitchen. Warm & homey are some of the typical characteristics of country style kitchens, and this particular design definitely fits that idea. It has that casual and relaxed feel, yet still remains elegant. In this design, walls were painted yellow and paired with solid Teak wood floors. 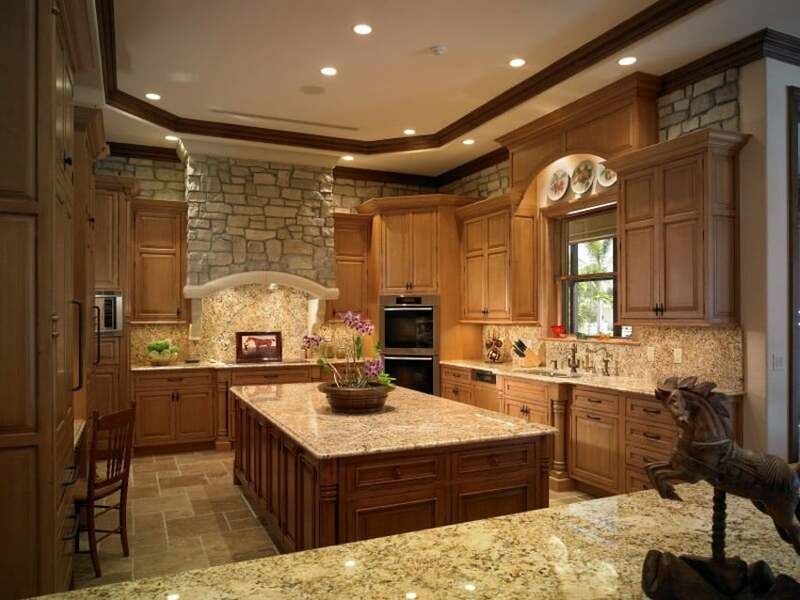 This is combined with golden walnut kitchen cabinets creating a medley of warm colors. To help balance the warm colors, gray salt & pepper granite was used for the counter top, and the chairs used are black. The large windows also help in making this kitchen feel bright and well-balanced. Painting traditional kitchen cabinets somehow gives kitchens a romantic shabby chic appeal. 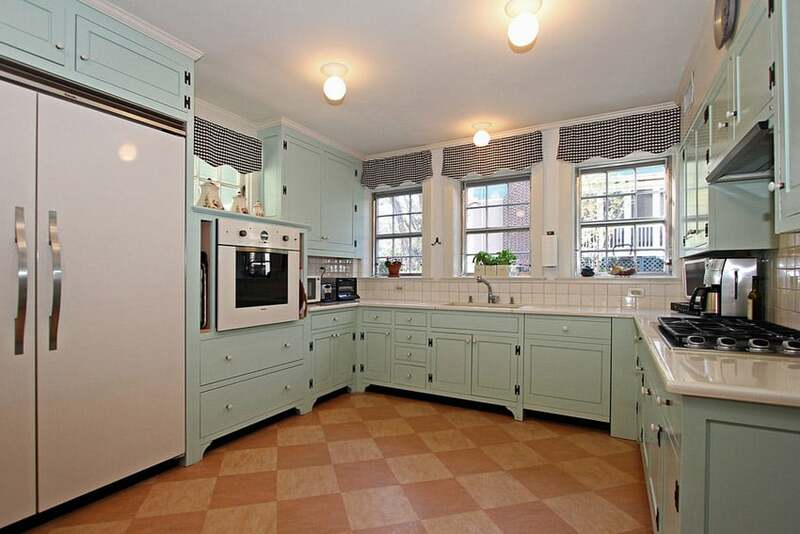 In this case, the cabinets were painted in a very light mint green color, giving the space a cool feel. The checkered valence curtains adds to the overall effect, while the smooth white surface of the white marble counters and backsplash gives it a more modern look. The detailed profile of the natural Oak cabinets used in this kitchen create a very elegant appeal whilst keeping a rustic feel to it as the finish used is not too glossy. The matte finish somehow gives it a weathered look, while the textured ceramic tiles on the back splash gives that rustic feel. It ha a small movable kitchen island at the center which uses weathered white legs paired with maple wood top and a matching all-wood stool. As this kitchen mostly has wood finishes, the black & white traditional area rug beneath the kitchen island helps break the monotony of wood finishes and gives a subtle contrast to the kitchen. 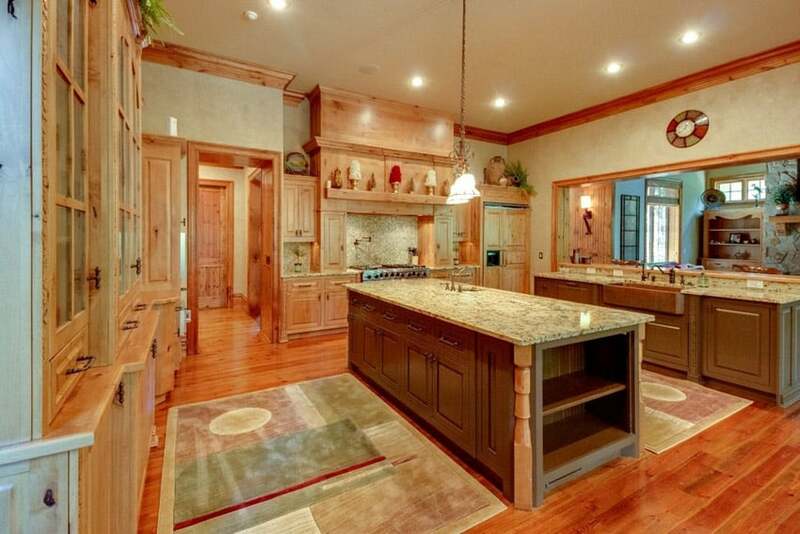 Country style kitchens doesn’t always have to be heavy on wood. 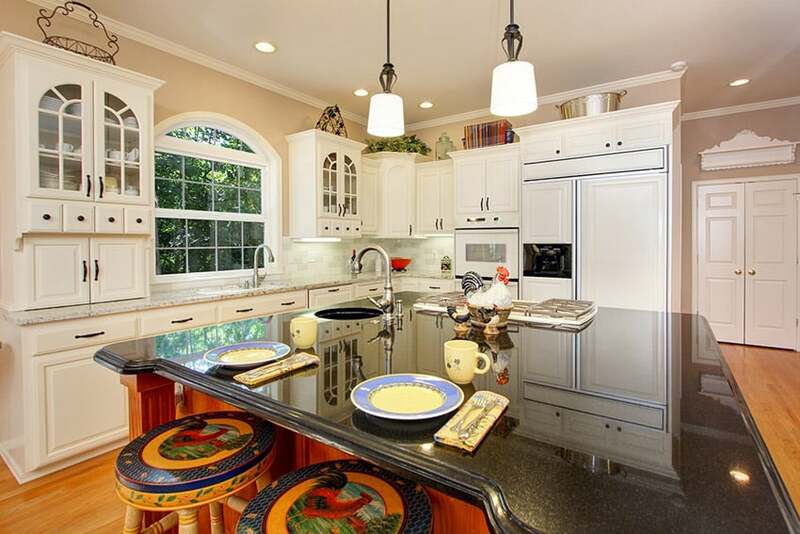 This example shows a country style kitchen which uses white-painted kitchen cabinets paired with white marble counters. 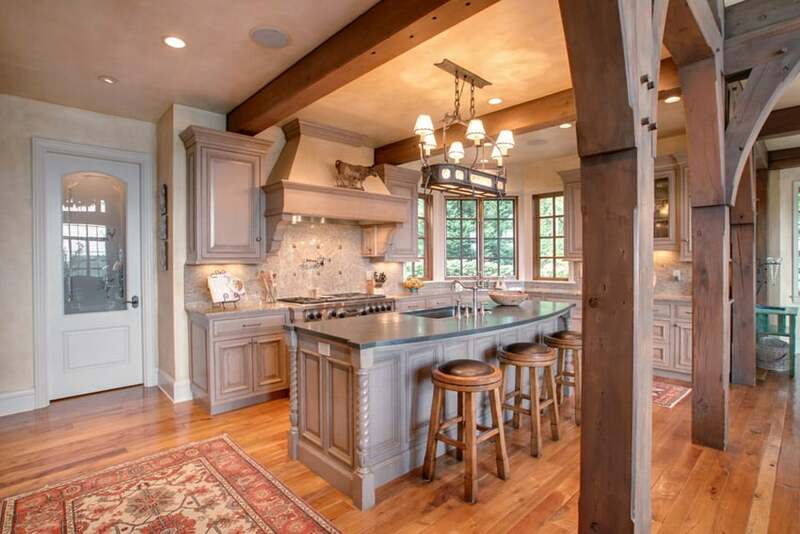 To complete the country effect, a wrought iron chandelier was placed above the kitchen island, and there were also 4 bar stools with solid oak framing placed by the counter. 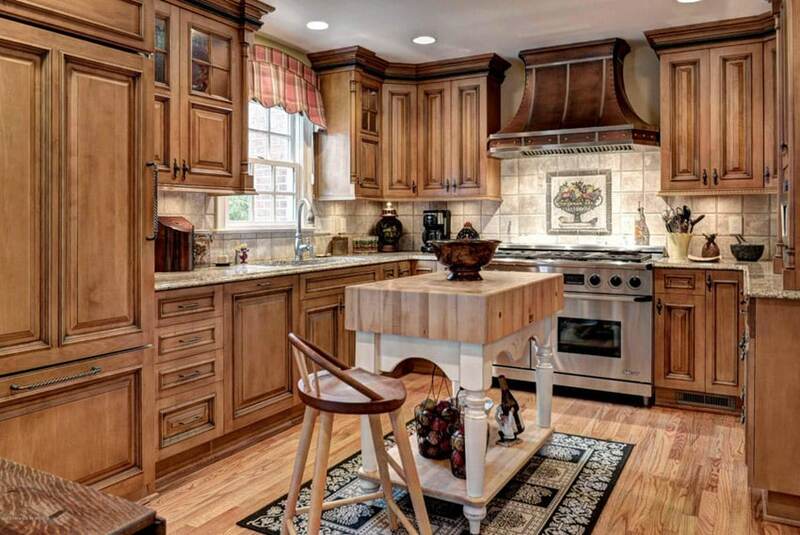 This kitchen combines classic country kitchen style with a few Gothic elements. The kitchen looks verg spacious thanks to the high sloped ceiling with large winows which helps illuminate and extend the space. Cabinets are all in who e and topped with red granite counter top. The exposed bricks on the sloped ceiking wall adds a Gothic vibe to the space along with the metal bar stools with gothic details/motifs. 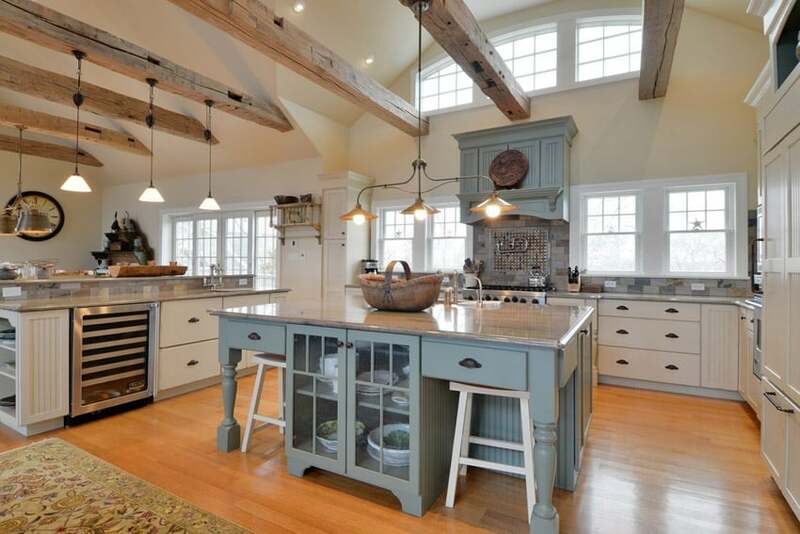 This is a great example of a modernized country style kitchen. Instead of typical traditional style kitchen cabinets, this uses a simpler profile for its cabinets. 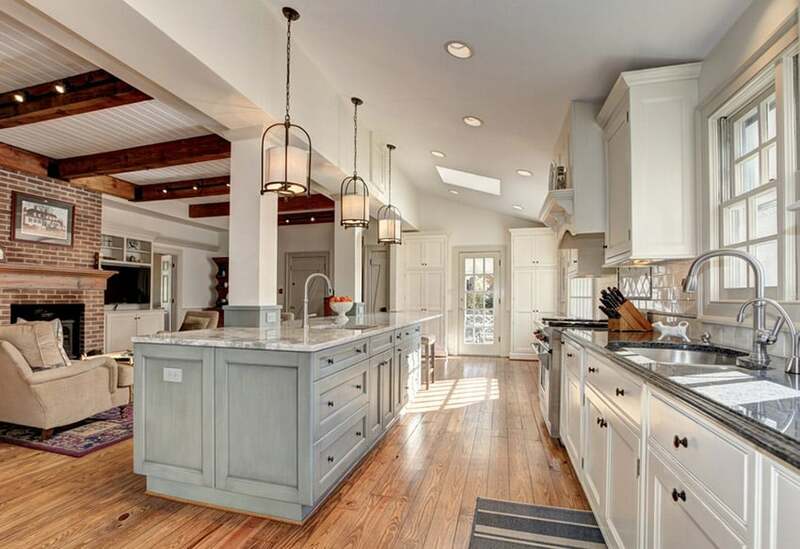 However, it uses a combination typical to country style kitchens: solid teak floors, white main cabinets and sage-green painted kitchen island. 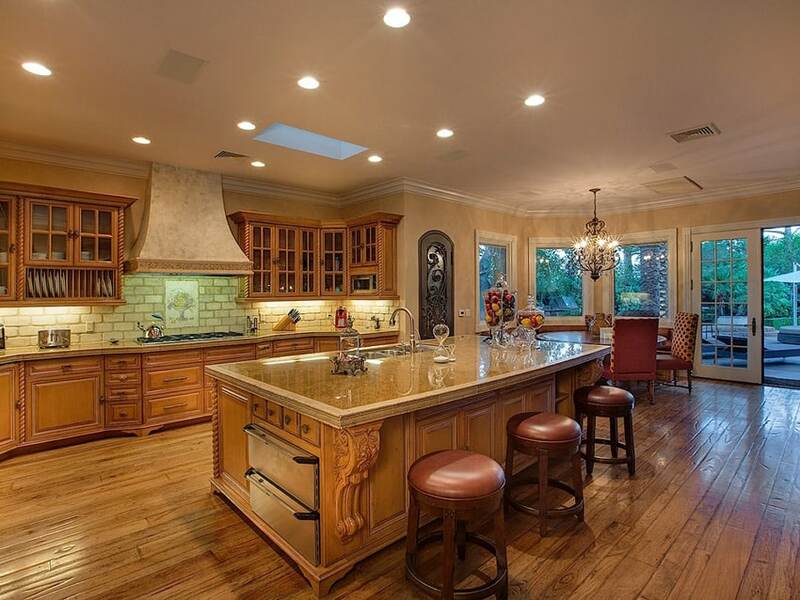 This even uses wooden barstools painted in a pale yellow color to match the kitchen island. This kitchen has a great balance of colors and finishes, combining red-orange tones from the wood finishes with subtle green undertones, creating a balanced complementary color scheme. Walls of the kitchen has a unique rag-roll finish, giving it the appearance of concrete, yet has that slight green tinge perfectly complementing the red tones of the Cherry wood floors. The kitchen cabinets on the other hand, uses a more neutral beech wood finish, but still has that slight orange tones. For the kitchen island and on of the counters, the cabinets were painted in a gray finish with a green undertone to keep with the color scheme. 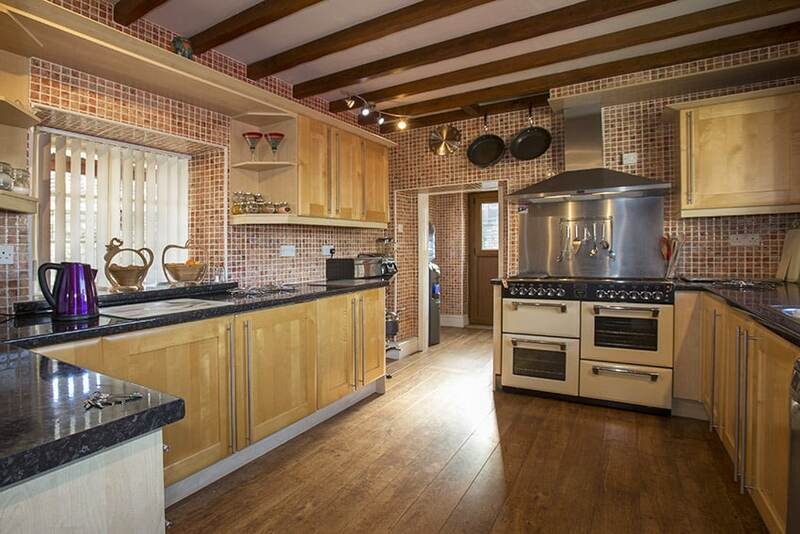 Modern design aesthetics work well when mixed with country style kitchens. This particular example has a very modern plain and light background: off-white walls and light beech wood engineered wood floors. The kitchen also uses skylights, making the space look brighter, and exposed wood trusses in natural teak wood finish. 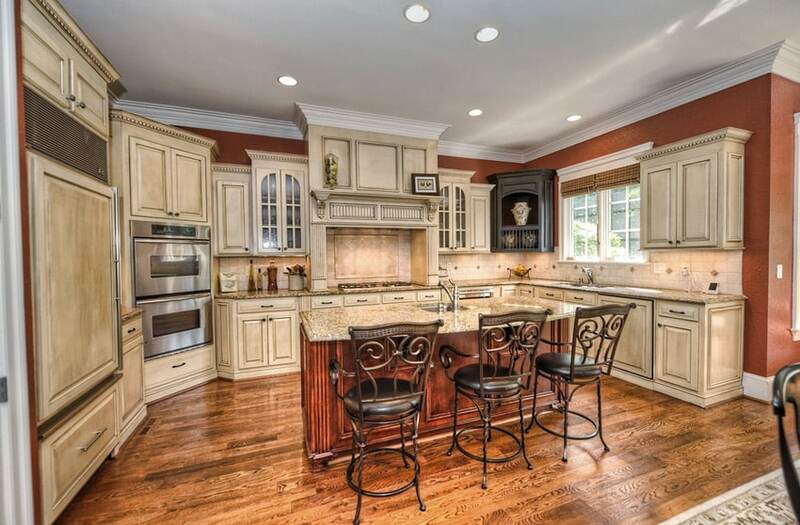 The kitchen uses country style kitchen cabinets in white finish and topped with solid mahogany counter top. Four different major finishes were combined in this kitchen to create this look. The floors are bold red cherry engineered wood floors, while the cabinets is a combination of 3 different finishes: white, black and oak wood finish. 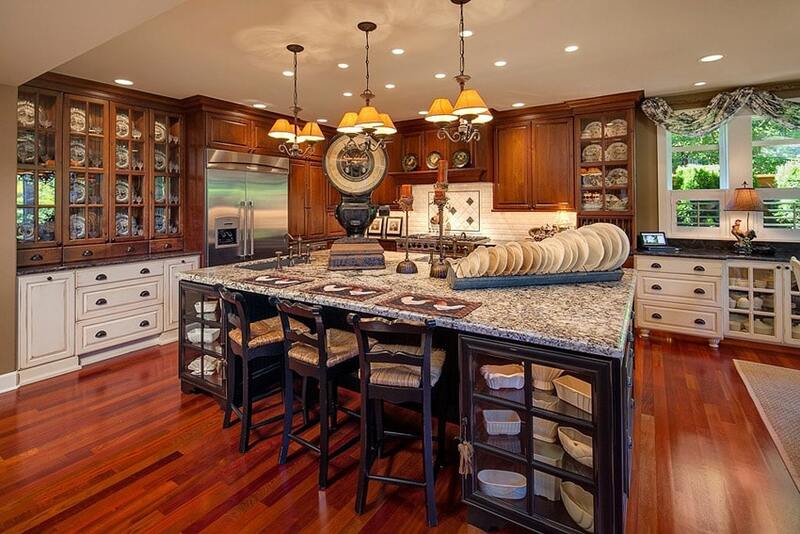 There are also 3 different counter tops: salt & pepper granite, black marble and brown granite. 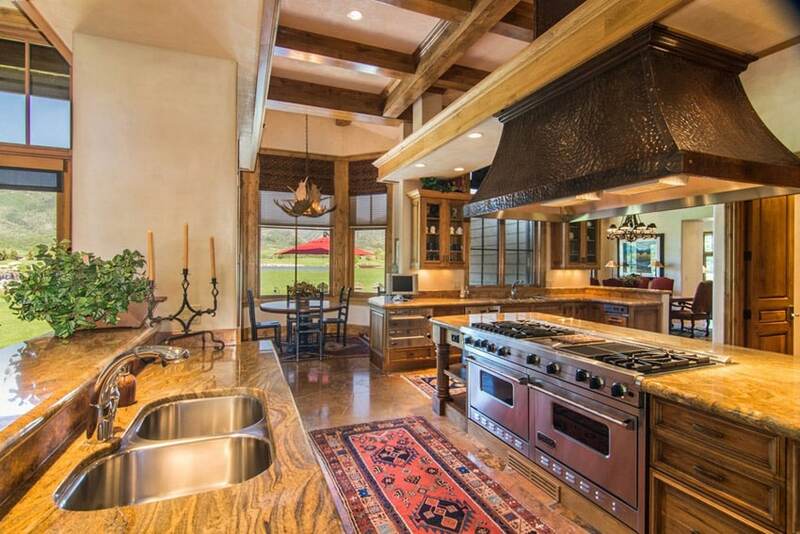 The wood tones used in this kitchen has a lighter and more earthy feel. Floors are natural golden oak, giving it that natural texture, and the kitchen cabinets uses a smoother finished natural oak. The walls also matches the tone of the granite counters, using a peachy yellow paint color, giving a very light background color which doesn’t overpower the other finishes used. 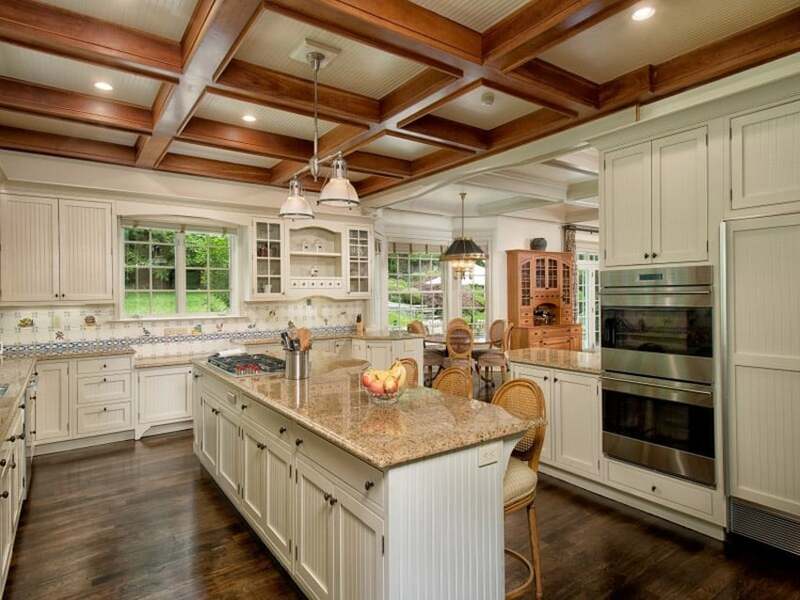 The unique sloped shape of the ceiling gives this kitchen a good ceiling height, as well as illumination as it has additional windows on the upper part of the walls. There are ornamental wooden trussed from salvaged wood which gives a nice rustic look to the space and serve has great locations to hang drop lights and chandeliers. 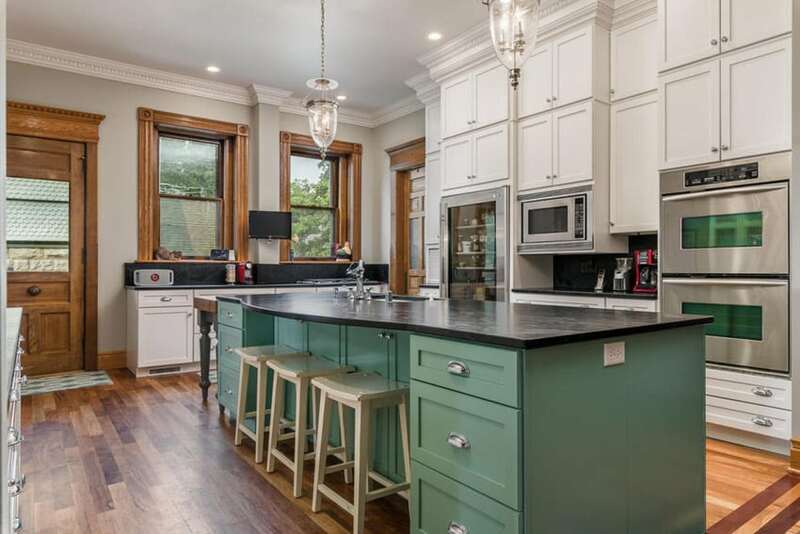 For the kitchen itself, it goes for a white kitchen cabinets with gray counter top and light teal antique finish kitchen island and range hood cover. The dark walnut floors give a dark and mysterious base for this country style kitchen, and the coffer ceiling with solid wood mahogany finish really gives off that classic kitchen look. The kitchen cabinets were painted in an off-white color and paired with light cream granite counters to create a lighter feel to the kitchen space despite the dark wood finishes on the floors and ceiling. It also uses rattan furniture in a light wood finish, creating a really authentic country feel. This small kitchen adapts a modernized country look. It uses classic style kitchen cabinets painted in a vintage violet color which is a grayish violet color. This is topped with black solid stone counter and salt & pepper. The finish of the kitchen cabinets matches the natural finish of the wooden columns and complements the teak wood floors of the kitchen well. 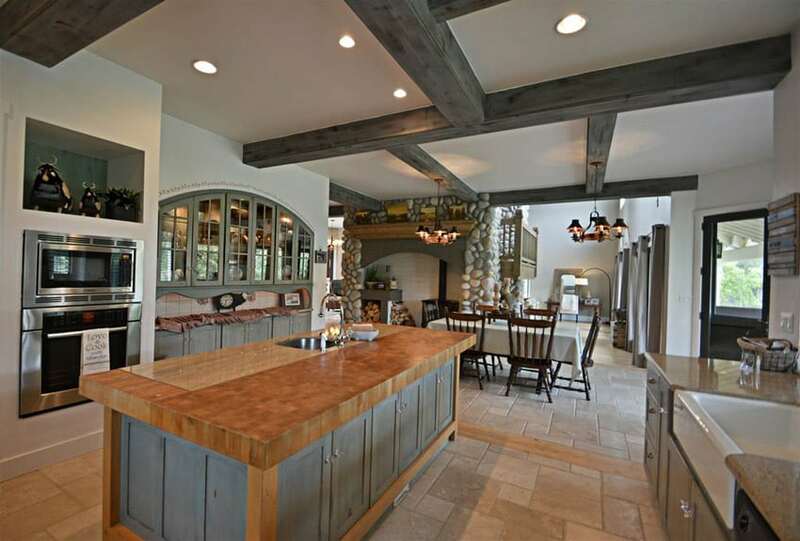 Each element of this kitchen really blends with the architecture of the space and use classic country-inspired elements. Solid walnut cabinets with natural stone counters with a unique pattern give an elegant appeal to this kitchen, while the hammered metal range hood gives that really classic/antique vibe. 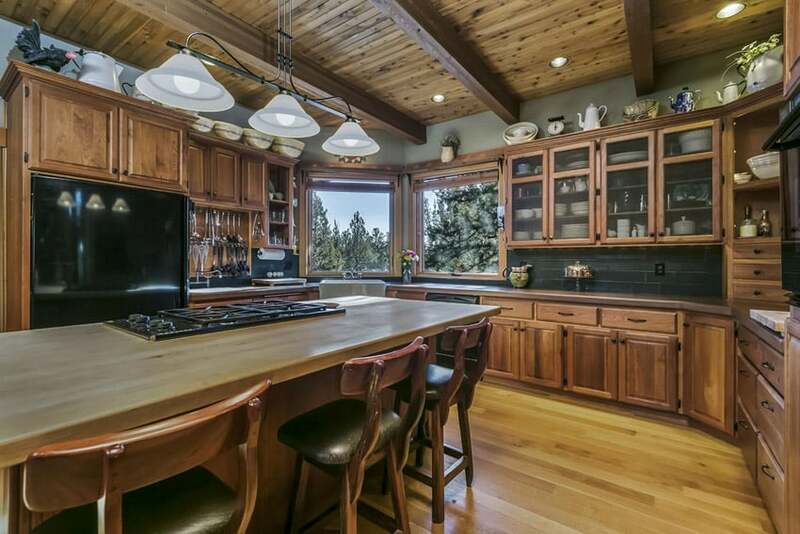 The kitchen cabinets matches with the other wood elements of the kitchen like the wooden framing of the doors and windows, as wells as the wood finish of the ceiling. This kitchen is able to achieve that old-world look with its use of faux masonry cladding on its walls and the range hood cover. The kitchen cabinets are also finished in natural light oak color to give it a soft earthy tone. This is paired with cream-colored granite counter top and natural stone floors, adding a variety of textures into the space. Weathered wood floor plants and ceiling framing really gives this kitchen space that authentic country vibe, while the clean white walls and ceiling gives that minimalist appeal of modern spaces. The combination of the two styles creates a refreshing look, allowing you to mix finishes and materials. For the kitchen cabinets, all were painted in white with a simple profile and topped with concrete-like quartz counter top. Other elements like the weathered rattan bar stools, white subway tiles and counter-weight drop lights, on the other hand, gives a retro modern element to the space. From the choice of finishes up to the styling and furniture pieces used, this kitchen truly reflects the look of a classic country-style kitchen. Golden Teak wood floors, natural Oak finish kitchen cabinets with granite top, a red-painted kitchen island with butcher’s block counter top, rush seat bar stools, iron overhead pot rack with copper pots and various china displays placed above the overhead cabinet – these elements placed together create an authentic country kitchen look. This kitchen goes for bolder and darker color combination, creating a masculine appeal to the space. A variety of wood finishes was used in this design: maple wood floors, natural teak ceiling, walnut kitchen cabinets, polished mahogany bar stools and solid beech wood kitchen island. The variety of woods used in the space complements each other rather than compete with each other. 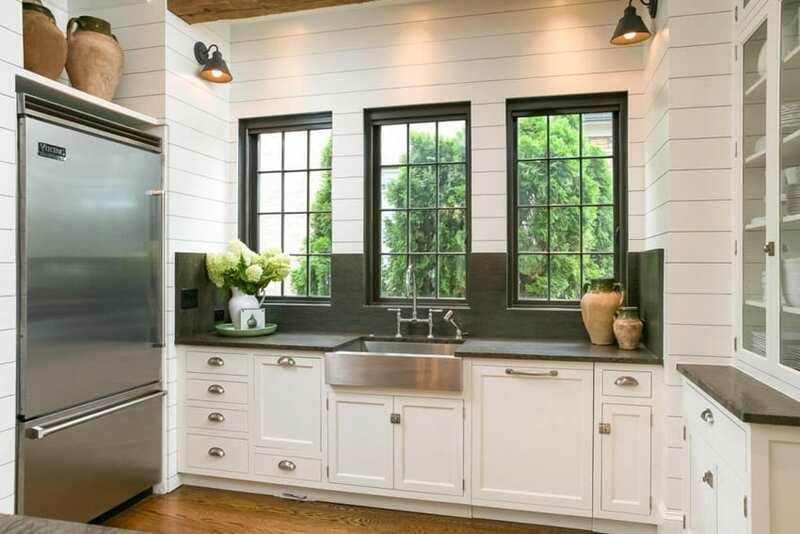 For the walls, it was painted in a green color, while the subway tiles used were black to match the black appliances and pulls/knobs used in the kitchen. 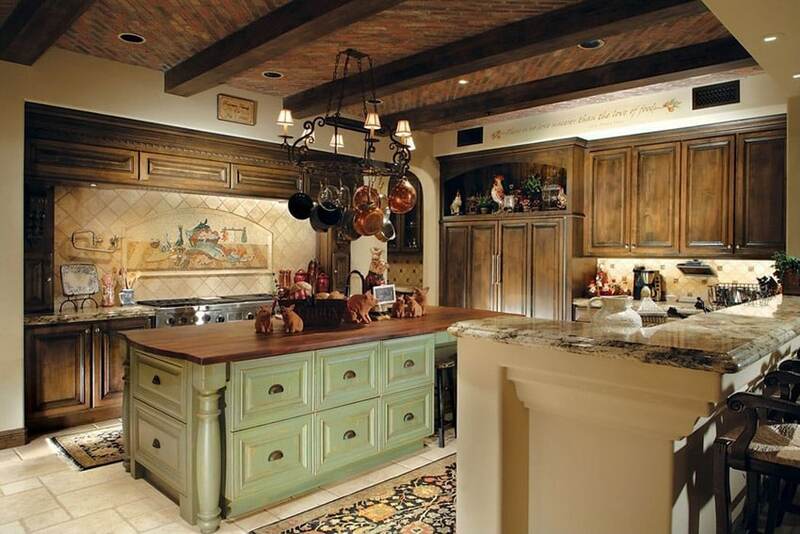 Completing the country look of this kitchen are the wrought iron elements and the random china and rooster figurines placed above the overhead cabinets. The flooring used in the kitchen and the connecting dining area is already bold as it uses terracotta tiles and has a unique pattern. This makes the floor surface look busy, so this is compensated by using plain off-white painted walls to balance it out. The kitchen uses 2 tones of wood to create this look: teak wood finish for the main kitchen cabinets to match with the finish of the window and door frames, and pale beech wood for the kitchen island. 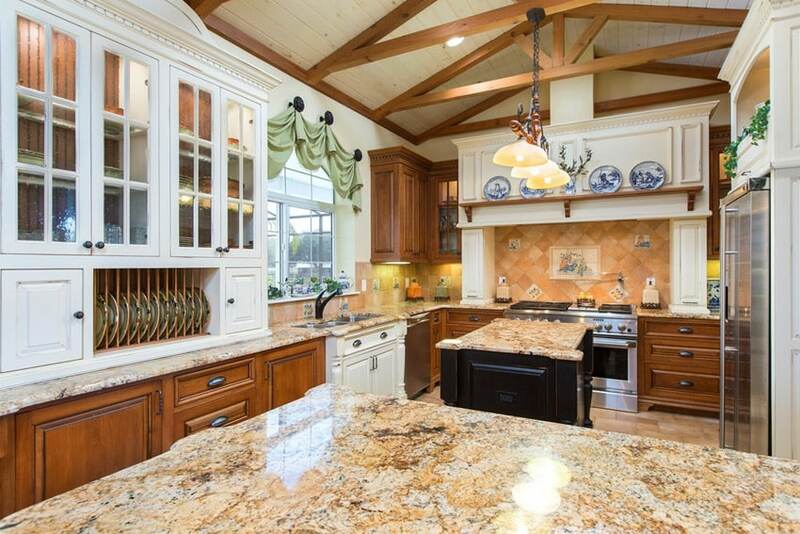 This country style kitchen goes heavy on wood. The floors are solid natural walnut, and the kitchen cabinets used are also natural oiled walnut, giving it that authentic country vibe. Black granite was used with these gorgeous wooden cabinets and uses black finish fixtures and pulls. The kitchen island was painted in antiqued dark brown finish to enhance the rustic appeal and topped with natural stone counters in a natural brown color. 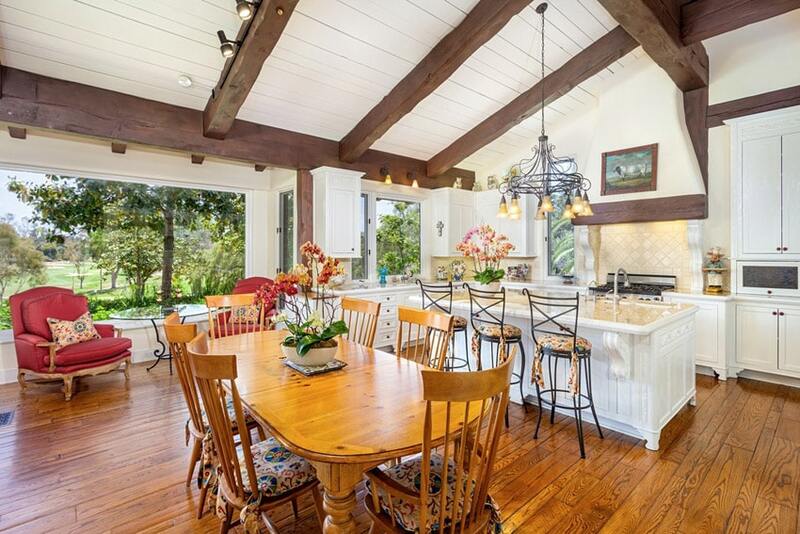 The rustic finish oak wood floors already give a rustic and old country vibe to this space. Paired with classic walnut kitchen cabinets with gorgeous salt & pepper granite counters placed against plain white walls, the classic appeal of wood finishes really comes out. To give it a little modern touch, the kitchen island base was painted white and used smooth black granite for the counter top. Dark copper painted walls and solid walnut floors give the space a warm and dark background, so the kitchen cabinets used were in a light ash color, making it a oale contrast against the dark colored walls. The kitchen island is an interesting piece, however, as it represents the colors of both walls and main cabinets using mahogany finish base for the copper toned walls and light beige granite to mimic the light ash wood. 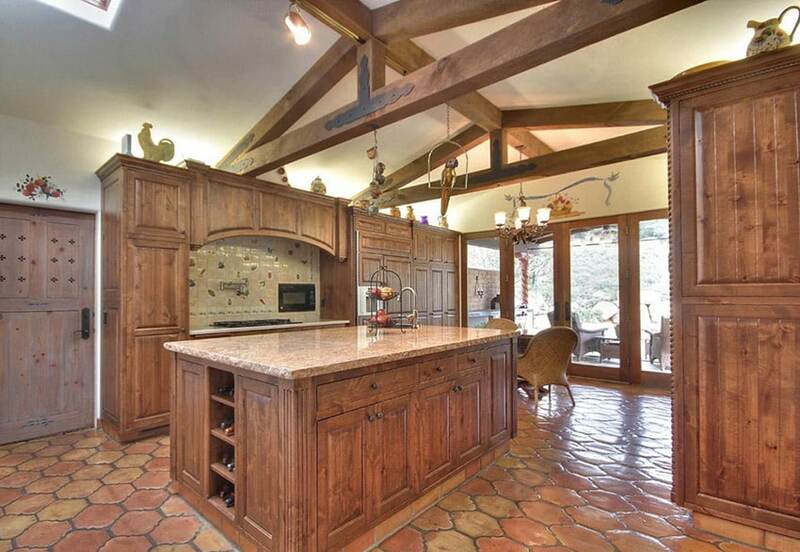 This kitchen truly gives that rustic country vibe with its choice of finishes. Natural teak wood kitchen cabinets, ceiling and window frames combined with natural oak finish rush seat bar stools. It also uses black counter top and paired with rustic brown ceramic tiles for the back splash. 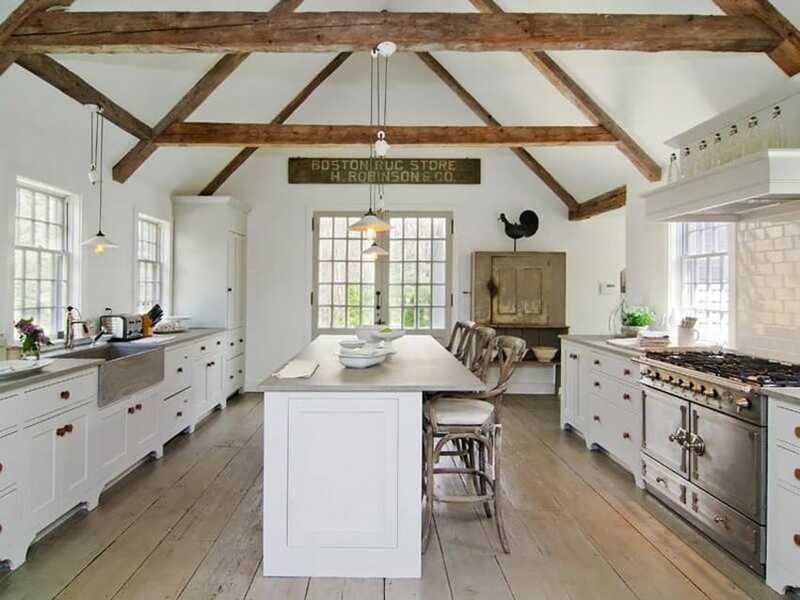 Despite its small size, this quaint kitchen definitely fits the country vibe of the interiors. 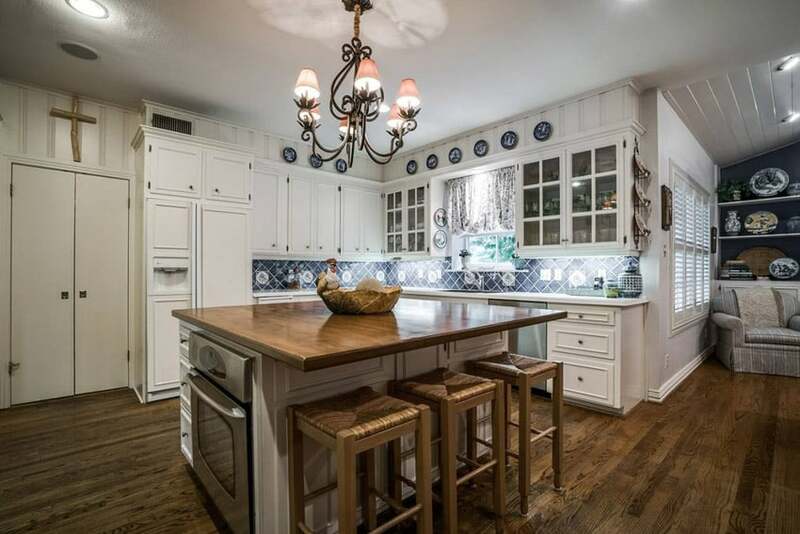 It uses rustic white finish on its kitchen cabinets and real antique frosted glass to match the white dining chairs. The gray granite counters help complete that authentic country vibe, as well as the classic style fixtures. The beige painted walls, wood columns and beams, as well as the wood finish moldings also contribute to create this look. This country-style kitchen uses a very modern aesthetic, using black & white color scheme and clean, crisp lines and patterns. The walls have horizontal panelings and are all in white with black-framed windows, while the kitchen cabinets are also in white with black natural stone counter top and back splash. The whole look is very simple and clean, credited to its modern aesthetic, while small elements like the ceramic accessories, wooden beams and retro wall sconces gives it that country look. The style of this kitchen is definitely country, but it uses modern-inspired combination of colors and finishes. Plain white walls is paired with rustic gray finish kitchen cabinets topped with light beige granite to match the similarly-finishes wooden beams. The gray color looks similar to concrete finishes popularly used in modern spaces, creating a dark and neutral surface which contrasts with the light-colored walls. 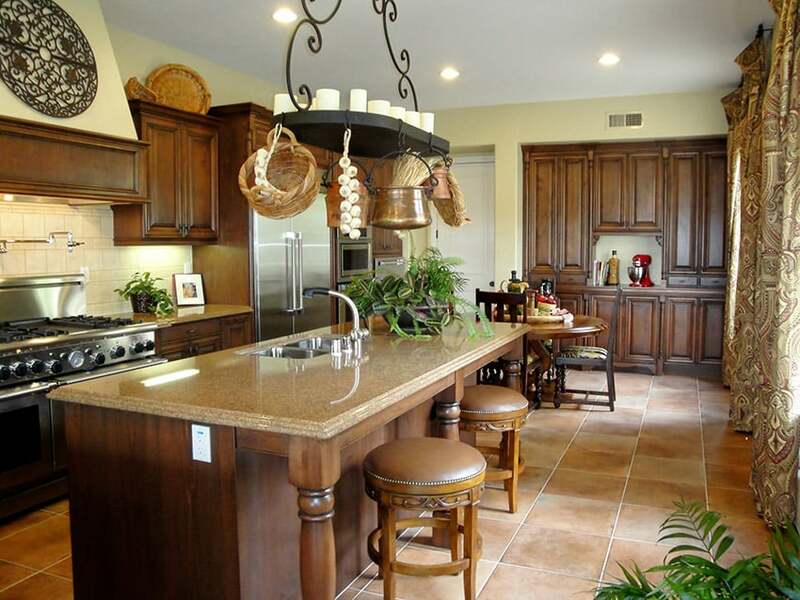 Country kitchen designs are known for having eat-in dining and breakfast bar islands. 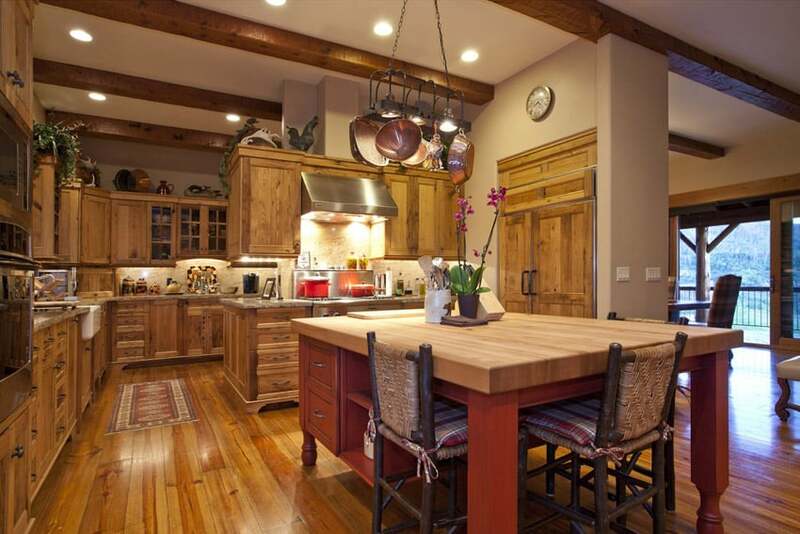 This rustic wood kitchen goes for a central table that acts as a place for eating and can work for food prep as well. 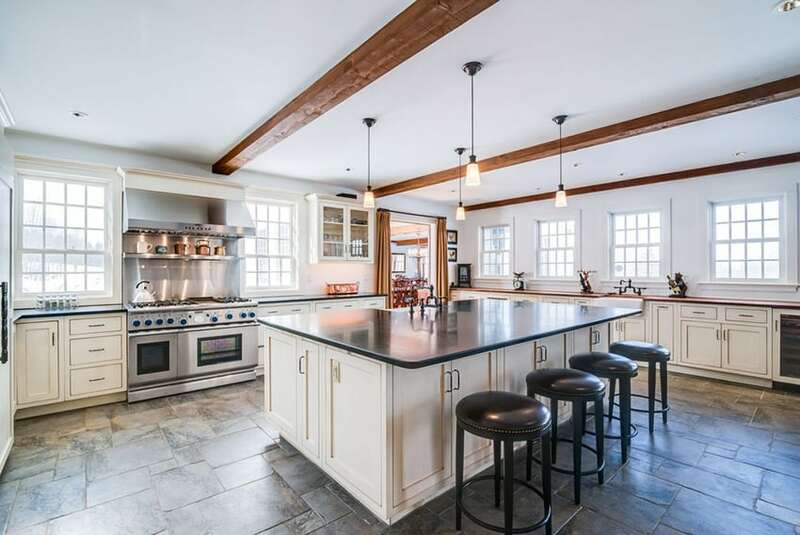 The old bricks on the cooking area really give that authentic aged appeal to this small kitchen, and this is further emphasized by using natural oil-polished furniture pieces, doors, windows and kitchen cabinets, creating a unified look for this kitchen. Natural walnut was the wood of choice as it has a soft, subtle color, yet has an elegant appeal. 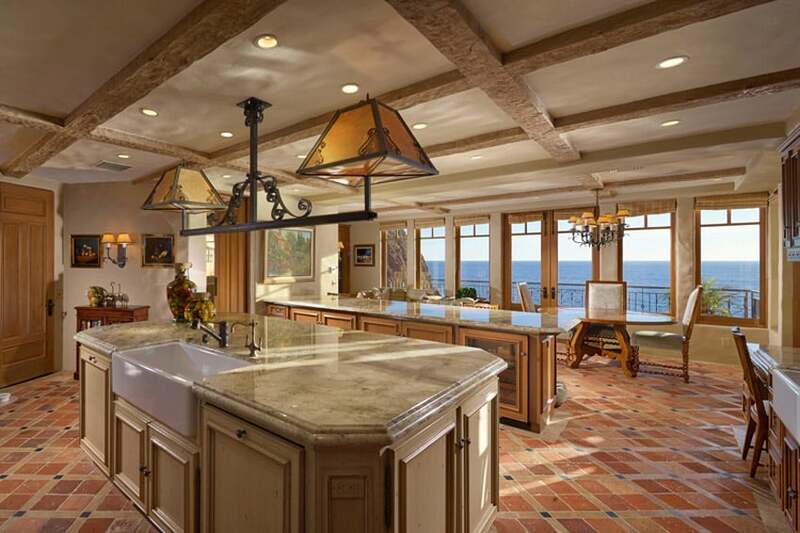 The walls of this kitchen has a very interesting finish. It looks very busy as it uses terracotta colored mosaic tiles, giving it that rough texture and small square patterns. 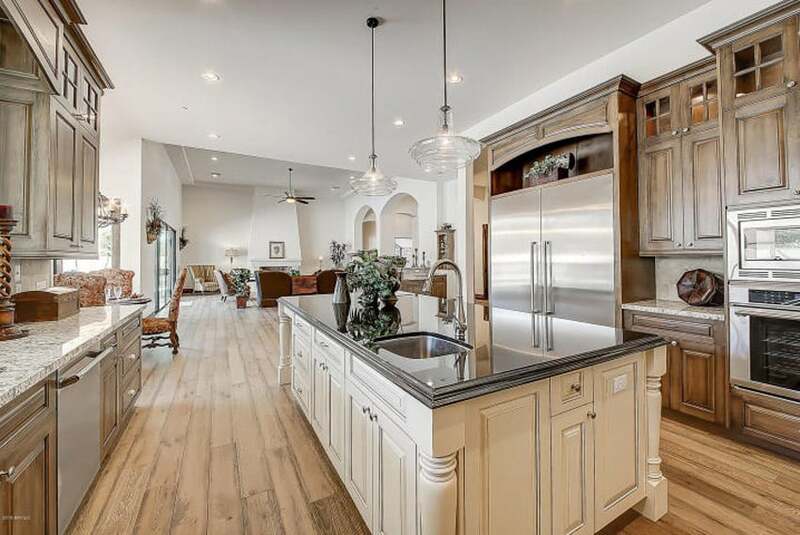 The floors are engineered dark oak so it looks smooth and polished and does not compete with the bold finish of the walls, while the kitchen goes for natural maple kitchen cabinets and blue pearl granite counter top. The maple cabinets has that light yellow color and that raw unfinished look despite being oil-rubbed, giving the space that nice rustic feel. Light yellow walls and light orange ceramic floor tiles gives this kitchen a bright and cheerful background, complementing the elegant dark walnut kitchen cabinets. The cheerful colors of the walls helps tone down the tendency of dark walnut to look heavy. As a result, this kitchen looks elegant and well balanced, with unique country-inspired wrought iron elements and a touch of greens to enhance the look of the space. This kitchen design is all about patterns. The ceramic floor tiles are in a combination of octagons and small squares, creating a bold and interesting floor pattern. Walls were kept plain to make wall for the unique flooring, while the kitchen cabinets uses a uniform natural oak finish. The interesting element of the kitchen cabinets would be the variety of paneling design used on the cabinet doors, adding different patterns to the space. As the kitchen is already full of patterns and wood warm colors, the counter top finish of choice was gray soapstone. Traditional kitchen cabinets, traditional fabrics and antique furniture pieces gives this kitchen space a really authentic old country look. There are exposed bricks used on the fireplace and the cooking area which has that natural antique finish, giving the space a nice rustic feel. Walls were painted with a light sage green color, while the kitchen cabinets uses a very light mint color, creating cool feel to the space. Black granite was used on all counter top surfaces to add a neutral break of color, while the traditional fabrics adds a welcomed pattern and splash of bold colors into the space. Bold crimson red walls with cherry wood floors serve as the background for this kitchen. Due to the red tones of the general surfaces, the kitchen cabinets opted to use a lighter maple wood finish so that it does not compete against the reds. It uses black galaxy granite counter tops, black-painted range hood and a small black kitchen island to add a bit of contrast and delineate different surfaces from each other. 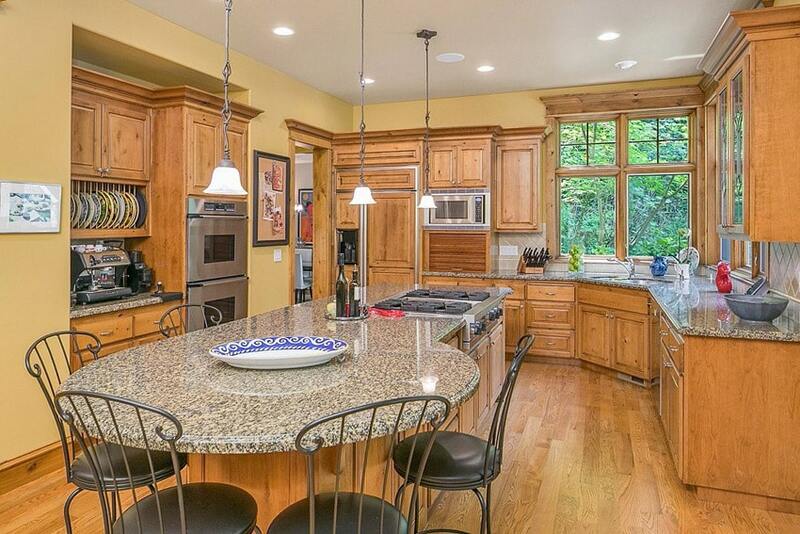 This kitchen uses heavy-looking finishes which really gives an elegant old world vibe. Floors are red ceramic tiles in a unique medallion pattern and is paired with plan white walls. 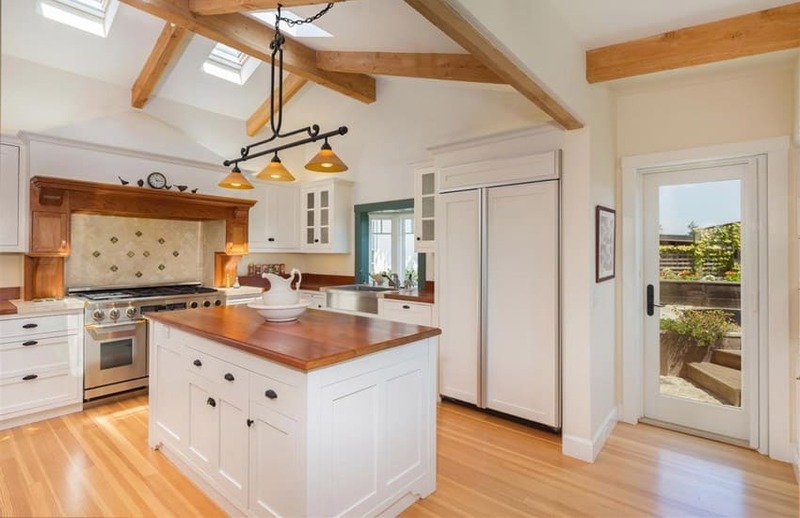 The ceiling of the kitchen is high as it has a gabled roof with exposed solid wood trusses, and therefore, despite the use of heavy-looking dark walnut kitchen cabinets, the high ceiling space helps balance it out and make the kitchen look spacious and light. Various country elements can also be seen in this kitchen like the rooster ceramic figurines, woven rattan furniture pieces, wrought iron accessories as well as fruit & flower motifs. Lighter colors were used for this white country kitchen as it has a very limited space, so lighter colors will help the space look bigger and less cramped. 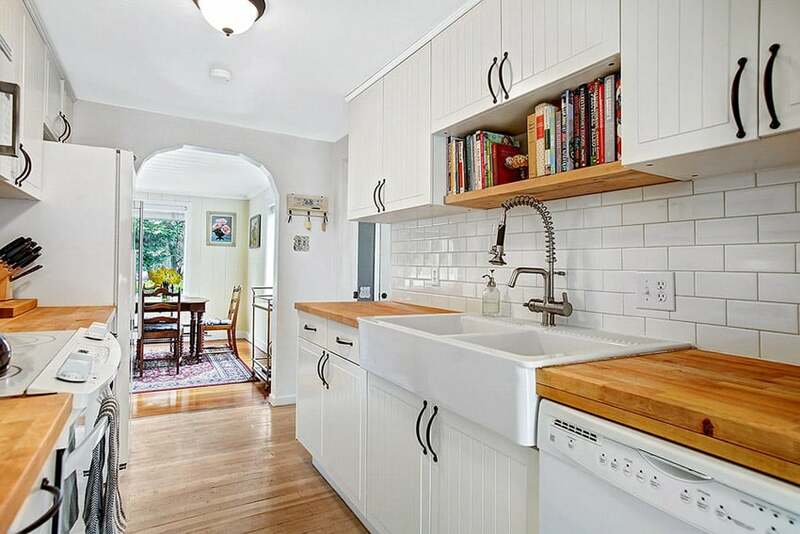 Kitchen cabinets used are all in white with vertical wood panels and uses solid wood butcher’s block counters and white subway tiles for the backsplash for that nice retro touch. 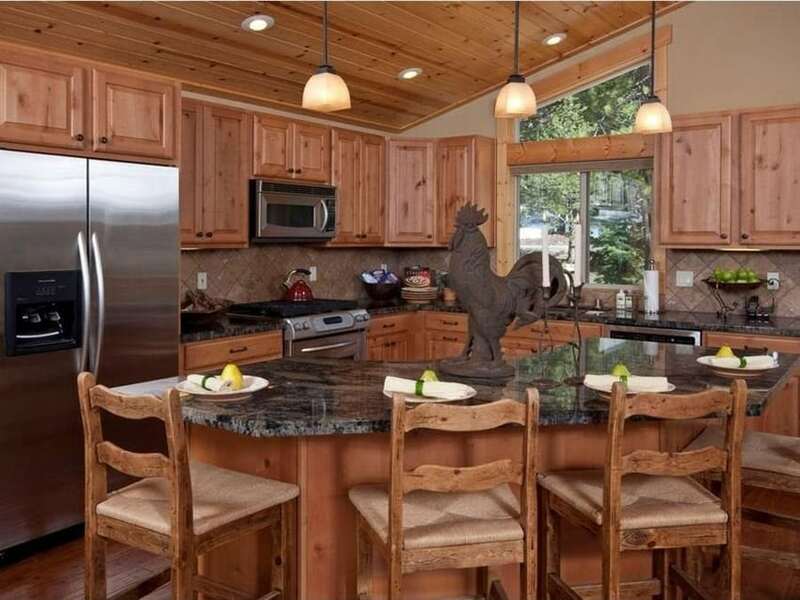 Adding rooster sculptures in your kitchen almost automatically makes it look more country, but this kitchen takes it on another level by not only adding rooster figurines, but also adding rooster prints on the seat of the spindle legs bar stools. Looking at the kitchen itself, it has that typical transitional style look – white kitchen cabinets with panel details topped with salt & pepper granite and a cherry wood kitchen island with black granite counter top. 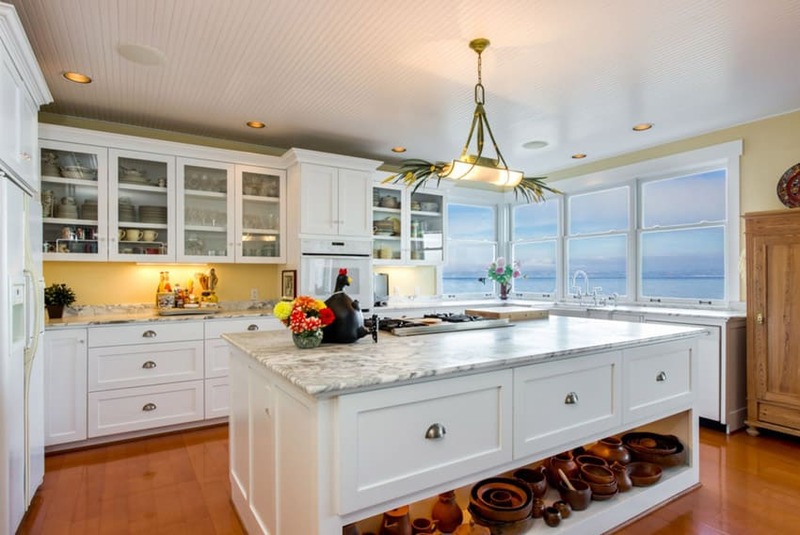 Offering an excellent view of the sea and using light yellow wall paint gives this kitchen a light summer feel. Kitchen cabinets used were all painted in white with a simple profile, giving a a transitional style appeal, while the white marble counter top gives it that classic elegance. 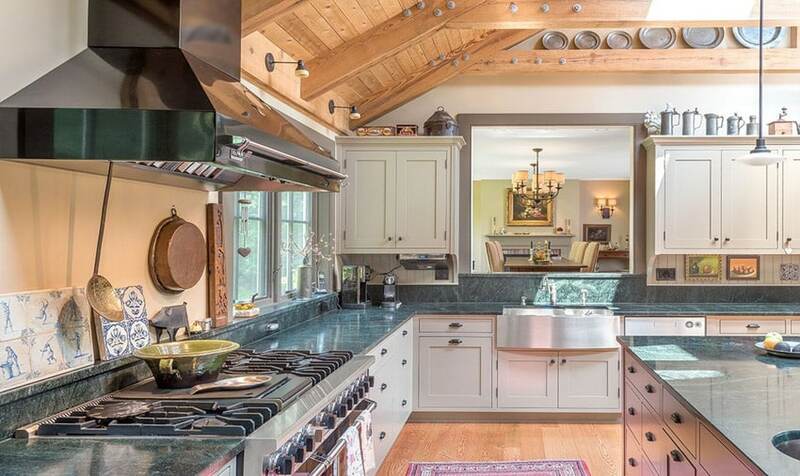 The first thing you notice in this kitchen would probably be the gorgeous emerald green granite counters and the pale mind green kitchen cabinets which perfectly complements the maple wood floors and ceiling. This kitchen is quite spacious with excellent natural lighting provided by the skylight and the large windows, helping make the space look bright and refreshing. 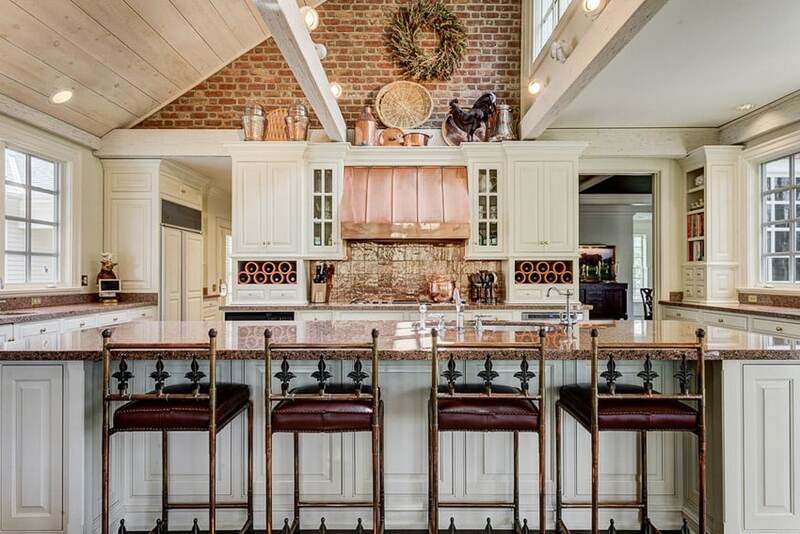 Other accessories like copper pans and galvanized iron items gives that old country vibe, making a more interesting kitchen design. As the space already uses a variety of wood tones on the floors, ceiling and other furniture items, the kitchen goes for a softer neo-classic look to help tone down the bold wood colors. The whole kitchen uses white cabinets with white marble counters for a seamless look and uses black wrought iron accessories and furniture pieces to really bring out that country feel. The bold straight lines of this white country kitchen reflects its modern aesthetics, while small items and accessories help give it a more country feel. Kitchen cabinets are pretty minimalist – it uses white painted cabinets topped with mocha brown solid surface and modern brushed stainless steel fixtures and pulls. The sleek kitchen cabinets however, are accessorized with country-inspired pieces like rooster figurines, metal wire baskets and woven baskets, giving it a subtle country touch while keeping that clean modern look. The black-painted kitchen island makes this traditional style kitchen look more modern and refreshing, as well as making it look bolder. 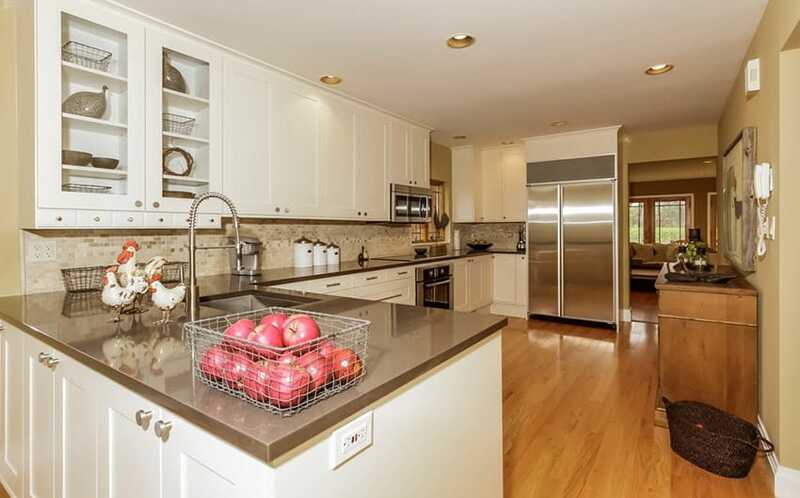 The main kitchen cabinets uses an off-white paint color with a natural weathered look and paired with cream granite. Due to the small space of the kitchen, the available ceiling space was utilized for overhead cabinet storage. The kitchen island also provides additional storage and display space, while the whole kitchen counter is accessories with ceramic figurines typical of country style kitchens. An oriental-inspired country kitchen with a good balance of different colors and textures. It uses walnut engineered wood flooring and paired with white vertical paneled walls. 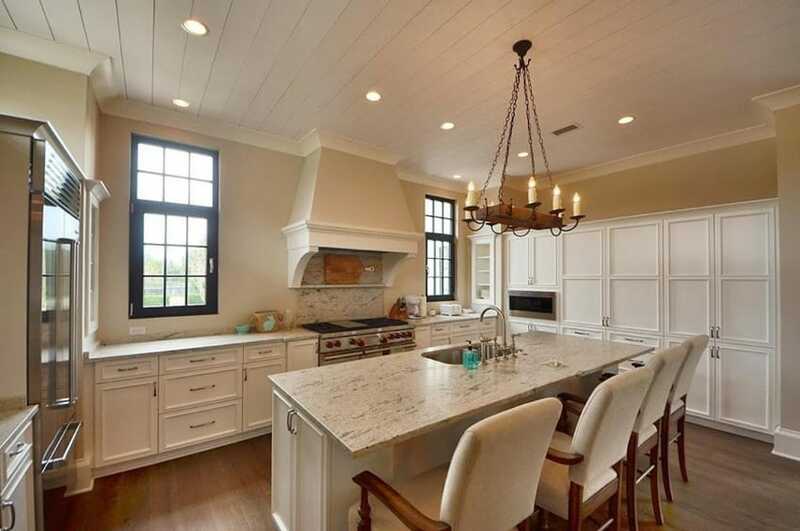 The kitchen cabinets are all in white with simple molding details and uses white solid surface counter top for the main cabinets, and golden oak butcher’s block for the kitchen island. The oriental inspiration is found on its use of blue & white ceramic plates on the walls which was also reflected on the backsplash tiles used. A modern transitional kitchen design which takes its inspiration from country kitchen designs. It adapts the shabby chic feel of country kitchens and incorporates it to the the modern space. White paneled cabinets with blue pearl granite counter and white subway back splash tiles was paired with pale powder blue kitchen island topped with elegant Carrara marble. The faux antique finish of the kitchen island gives that romantic feel, and the use of pale paint color makes this kitchen look light and refreshing.